My eight year old is home for summer and she loves to try her hand at cooking. 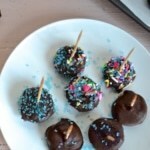 We read about this recipe ages ago and she was delighted when I told her that we were going to make Frozen Chocolate Banana Bites. They were very easy to make and I never knew that frozen bananas tasted so good! Here’s the recipe – enjoy making it with your little one or for your little one. Toppings, optional - sprinkles, coconut, chopped nuts etc. Line a baking sheet with parchment paper or wax paper.Cut the peeled banana into desired size. Insert the toothpick in each of the cut slices and freeze them for an hour. Mix the chocolate chips and coconut oil in a microwaveable bowl and heat in a microwave for 15 seconds. Remove the bowl from the microwave and stir well. Continue to heat the bowl in 15 second increments and mix well, till the chocolate is completely melted. Remove the banana slices from the freezer. Using the toothpick, completely coat the banana slices with the chocolate and set it on the parchment paper. 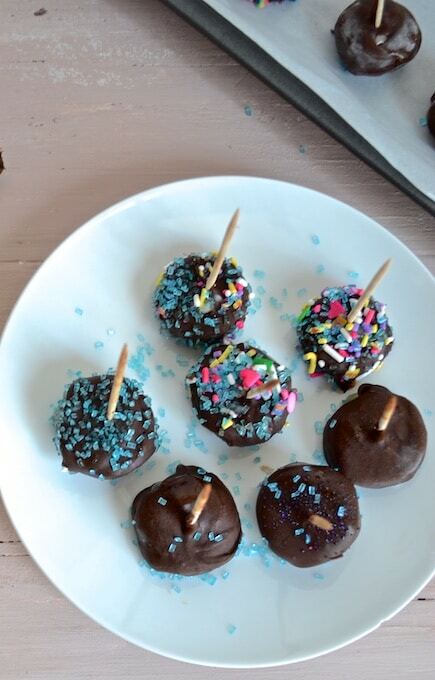 Sprinkle the toppings immediately before the chocolate sets in. Repeat the process with the remaining slices. Transfer the banana bites into the freezer, if not consuming immediately.